Is injected into infestation sites not only to eliminate drywood and subterranean termites, but also prevent them from returning to treated areas. Is safe for your family and pets, so you don’t need to find alternative accommodations while we treat your home for termites. Comes with a two-year warranty, so you can be sure our service is effective and that termites won’t return to your home. At Kilter, we offer free inspections and accurate estimates, allowing you to determine if our services are right for you without committing to treatment. If you’d like, we can also provide an extended service contract on a quarterly or biannual basis, which will keep your Solana Beach, CA, home free from termites as well as other household pests. 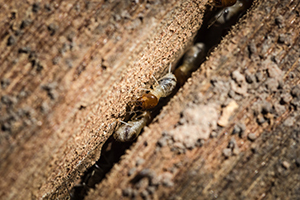 As a comprehensive termite control company, Kilter can even help repair damaged wood after your infestation has been eliminated. Our wood replacement experts use only primed, construction-length boards, ensuring repaired areas blend with their surroundings and maintain the structural integrity of your home. To learn more about the termite treatment and damage repair services that Kilter Termite and Pest Control provides in Solana Beach, CA, contact us today.